How Can I Participate in EDAW 2017??? Dress, decorate or light up in purple! Ask your municipality to light up a local landmark in purple and tweet the picture to @BridgePointCen2 with the hashtag #EDAW2017. SaskTel Center in Saskatoon will be lighting up purple to celebrate! Take a selfie while you are there and tweet with hashtag #EDAW2017~! Ask your municipality to issue a proclamation of the week. Most cities and towns have information about how to request this on their website. If you are successful, be sure to let us know so we can share the information with NEDIC, who is recording all the proclamations across Canada! Request a presentation from our team! Last year we presented to many classrooms, universities and health organizations across Saskatchewan. We’d love to come to you! 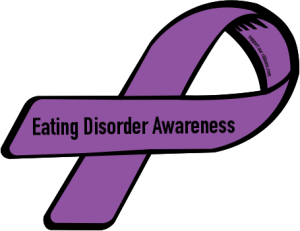 Talk about eating disorders and share your story. Don’t forget that you can share your story by filling in the form on the Inspirations section of our website. Donate to BridgePoint or your favorite eating disorder charity!